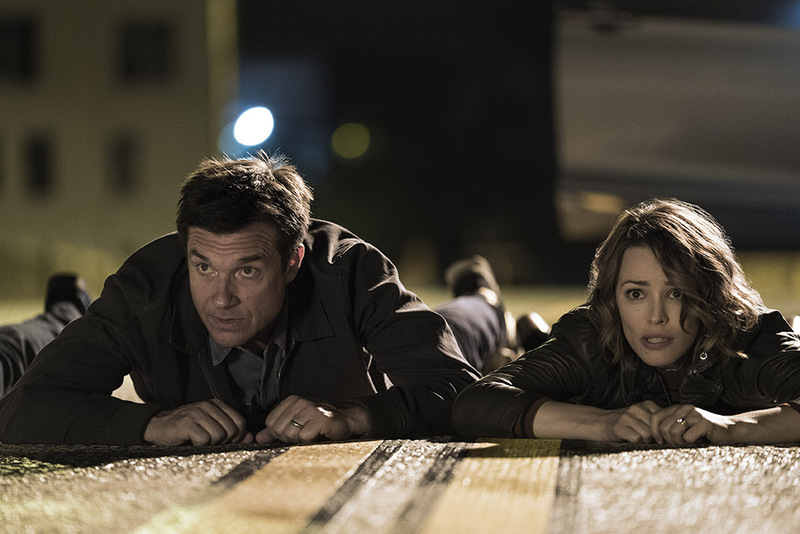 “Game Night” is a high-concept action-comedy that takes full advantage of its concept, and it might be one of the most technically stylish studio comedies in recent memory. With attention to performance, a command of tone, and plenty of filmmaking style, directors John Francis Daley and Jonathan Goldstein (2015’s “Vacation”) compile a cast of game comic performers to work from a tight, clever, sharp-as-cheddar script by Mark Perez (2006’s “Accepted”) that finds humor in a straight thriller scenario. 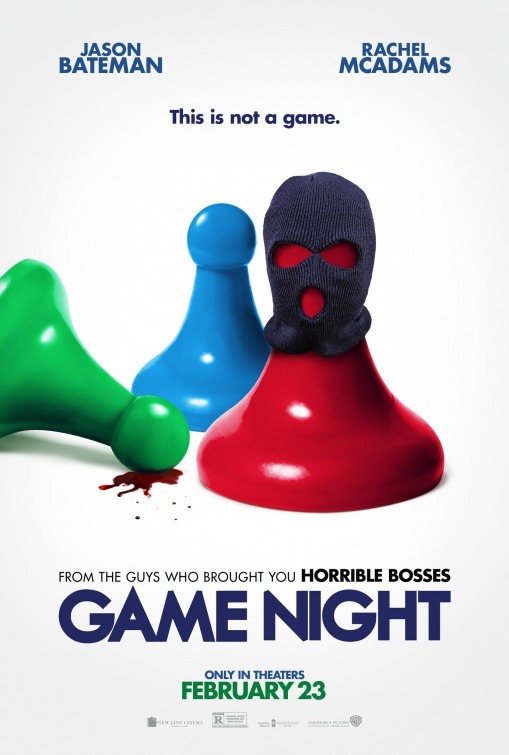 Unlike so many R-rated comedies that are either dumb, raunchy, heavily improvised, or all of the above, “Game Night” is thankfully none of those things, almost like a throwback to when farces were written with true care and intelligence. Who would have thunk it? Married couple Max (Jason Bateman) and Annie (Rachel McAdams) are such competitive game enthusiasts that they fell in love over their mutual pastime during pub trivia. Now, they host weekly game nights with close friends, lovely couple-since-middle-school Kevin (Lamorne Morris) and Michelle (Kylie Bunbury), and slightly moronic Ryan (Billy Magnussen), who always brings a new interchangeable blonde bimbo. One week, Max’s slick, rivalrous brother, investment banker Brooks (Kyle Chandler), whom Max hasn’t seen in a year, invites the gang, this time Ryan inviting along smart co-worker Sarah (Sharon Horgan), over to his bachelor pad for a “game night to remember.” Instead of playing Charades, Pictionary, or any of their go-to board games, he’s signed them up for an interactive “murder mystery," where one of them will be kidnapped and the winner who finds the missing person will get the keys to his Corvette Stingray. When the game commences, two goons storm into Brooks’ house, beat him up, and take him away, however, Max, Annie, and their friends go on, following the clues around town without realizing that the danger is real. Consistently funny with killer dialogue and outrageous situations, “Game Night” is a rarity in that the jokes keep firing without letting plot structure and characters fall by the wayside. It nails a tone between danger and farce, so that even when the violence gets a little bloody, the comedy doesn’t get mean or ever stop being funny. As the stakes escalate, Mark Perez’s script still organically makes time for the characters’ realities, like Max and Annie having trouble conceiving a child, without such story points feeling too forced, and plays on the expectations of thriller plot twists more than once. In terms of the hilarious hijinks that ensue, Annie uses what she’s only heard in movies to get some bad guys to the ground with a gun she doesn’t think is real and later cares for a bullet wound with improvised drug-store items; Max makes a mess of a white dog and a shrine of photos inside a neighbor’s home; and during the climactic showdown on an airplane tarmac, there is a very funny sight gag involving a very slow conveyor belt. Jokes that are set up early on pay off later and one-liners regarding Edward Norton, sturdy glass tables, and a movie mash-up reference to “Eyes Wide Fight Club” all hit. 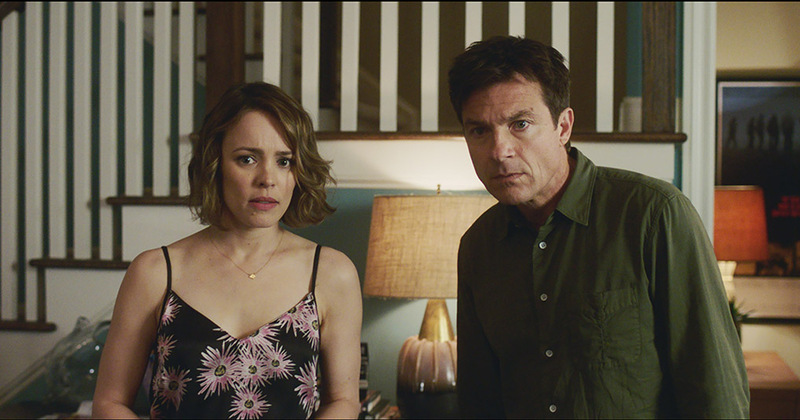 Jason Bateman and Rachel McAdams are each other’s equals; they’re funny in their own right, he with his affable straight-man sarcasm and her with her radiant smile and upbeat charm, and they actually feel like a real couple who react believably in dangerous circumstances. Always a bright spot no matter the project, McAdams particularly reminds that she has perfect timing when given the chance to perform comedy. Beyond the A-list co-leads, the winning ensemble gets enough time to shine, all playing fun, distinct and memorable characters whom the viewer likes hanging out with for two hours. Lamorne Morris (TV's "New Girl") and Kylie Bunbury (TV's "Pitch") are charismatic as Kevin and Michelle, who squabble throughout after Michelle admits during a game of “Never Have I Ever” to sleeping with a celebrity in the past when the couple was on a break; this allows Morris to do a dead-on impression of that celebrity. Billy Magnussen (2017's "Ingrid Goes West") is a secret weapon as Ryan, playing his dumb-blonde shtick in a way that is often sly and inspired; watch what he does when bribing someone with $17 for information. As new-to-the-circle Sarah, Ryan’s co-worker, Sharon Horgan (TV’s “Catastrophe”) brings her own dry wit and Irish charm to the front numerous times, establishing herself as a fabulous find. 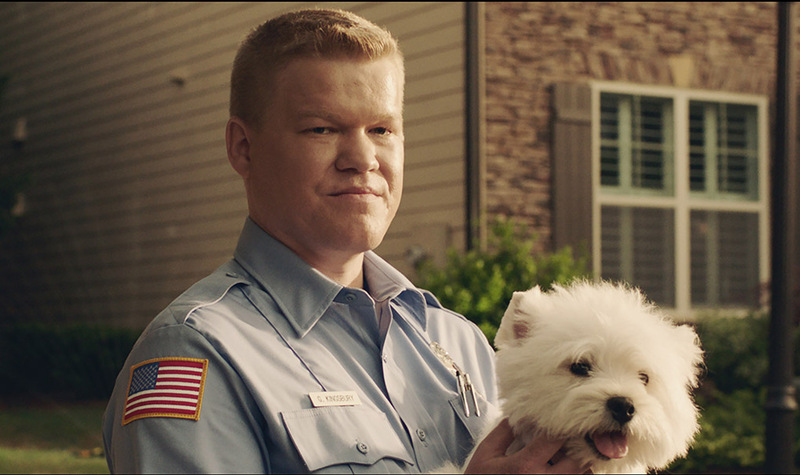 In another supporting turn, a committedly creepy Jesse Plemons never blinks with Michael Shannon-esque dead eyes and a fluffy white dog to pet as Max and Annie’s weird neighbor Gary, a lonely and socially awkward police officer who’s always in uniform and doesn’t get invited to game night anymore after his wife left him. 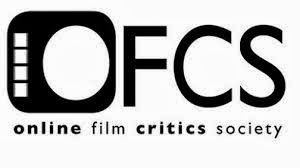 Coupled with a moody, edgy, propulsive synth score by Cliff Martinez, the film proves John Francis Daley and Jonathan Goldstein’s flair behind the camera with cinematographer Barry Peterson, along with the same snappy editing reminiscient of Edgar Wright’s “Three Flavours Cornetto” trilogy. Going in step with the film’s game vs. reality plot, several establishing shots have a tilt-shift effect, as if beginning as miniature diorama models on a game board, and a continuous shot of the group of friends playing a game of keep-away with a black-market Fabrege egg—a McGuffin—through every room of a mansion is a tense, energetic, elaborately choreographed bit of showing off. Sustaining energy in a comedy can be a tricky feat, but there’s no time to lag here, especially when everyone, including the viewer, is having such a ball. 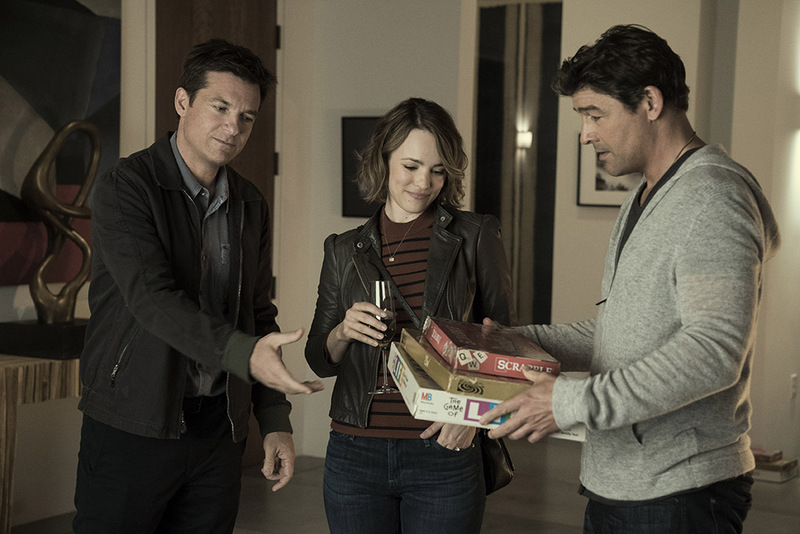 It might only be late February, but as one of the year’s inaugural comedic surprises, “Game Night” is a beguiling, side-splitting winner across the board.